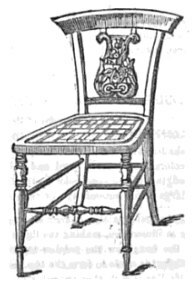 This fancy chair was shown as the latest fashion in cottage furniture in 1852. Listed as a fancy chair for the living room, this black and white drawing shows a chair with carved legs and backrest and a woven seat. The scan did pick up the words on the facing page but that just makes the image more interesting for mixed media and other collage-type projects. It was included in the June 1852 issue of Godey’s Lady’s Book.